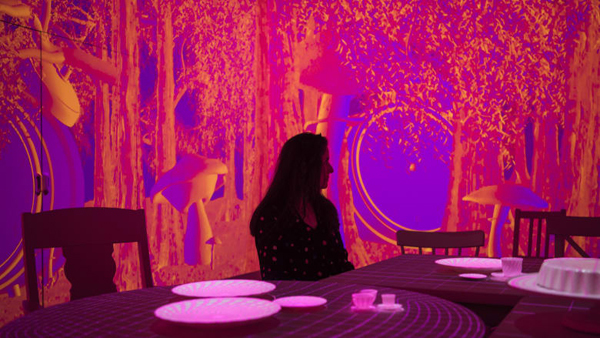 An immersive installation using projections recreates the Mad Hatter’s tea party. Photo: Josh Robenstone. Faced with entering a tiny doorway headfirst on hands and knees, it’s clear from the outset this is no ordinary trip to the museum. A replica of Lewis Carroll’s drawing room unfolds to more and more rooms filled with marvellous treasures: facsimiles of Carroll’s original manuscript; preposterous costumes; magical maps; tiny houses; giant chairs. Opening on Thursday, the Australian Centre for the Moving Image’s winter masterpiece exhibition, Wonderland, is a potted history of cinematic special effects – told through the story of Carroll’s ubiquitous Alice. There are no action film explosions or sci-fi space trips in Alice’s story. Instead, says Bram, it’s the story of making the impossible possible. “The idea that you see these shrinking and growing sequences, or you see a tumble down the rabbit hole or a cat that can talk, or a kind of garden of flowers that come to life in conversation – it’s about the imagining of that on screen in a way that feels true and convincing,” she says. Over the years there more than 40 films and more than 30 “TV moments” have been made of Carroll’s trippy 1865 children’s book. Wonderland takes visitors from the first Alice film in 1903 right up to James Bobin’s Alice Through the Looking Glass (2016). So we see Alice in Carroll’s original 19th century manuscripts and in John Tenniel’s early illustrations; in jerky black-and-white silent film; in hand-drawn animation, stop motion, CGI and more. But it’s much more than just a mash-up of film sequences. An immersive centrepiece sees visitors take part in the Mad Hatter’s tea party, sitting around a garden table as exquisite projections unfold on the walls around them, and on the plates and cups in front of them.